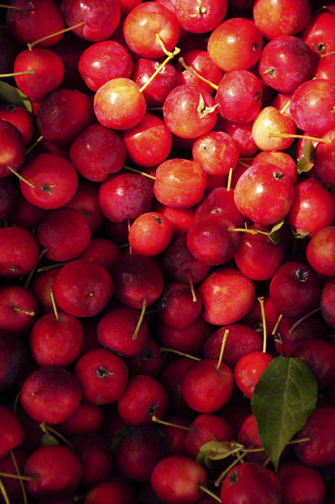 Cold hardy Dolgo crab apples originated in Kazakhstan and are a favorite early season treat. We love to dry them for winter snacking and find them very appealing in salads – think tart sweet of dried cranberries. The Dolgo crab apples began to color up a week ago. By Monday they had turned into ruby jewels ornamenting the trees, two days later much of the fruit hanging on the outer upper branches are a deep, dark crimson. Unlike their astringent crab apple cousins, Dolgos are edible — zesty, tart, a mouth full of sunshine. We dehydrate them for winter snacking and as an addition to salads and granola — think dried cranberry. They make a beautiful ruby jelly and when pressed they make a cider that looks and tastes like a pink lemonade treat. Originating in Kazakhstan near the Siberian border, Dolgo means “long” in Russian alluding to their elongated shape. Extremely cold hardy it is understandable why this antique crab apple was first imported in 1897 to South Dakota where winters are often unpleasantly frigid. Richard and Michael, two of Scott Farm’s dedicated Jamaican crew, arrive in the farm truck with a warm wave and hearty hello. 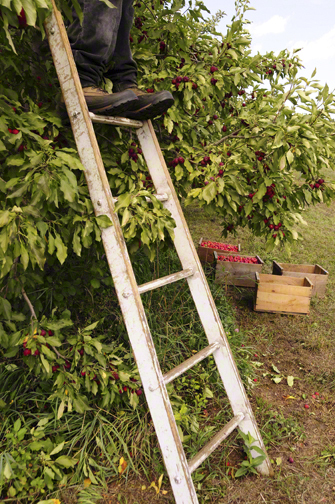 They have come to the orchard with their apple picking gear: harvest buckets, bushel boxes, and wooden ladders polished from years of use. There is a rustling of leaves as they set their ladders into the tree then a snap, snap, snap as they begin to pick, their fingers working deftly — quick, exacting — both are gentle, their large man hands easing the olive-shaped fruit into harvest buckets held to their chests by a harness strapped across their backs allowing free hands for picking and ladder climbing. At the base of their buckets hangs a canvas apron drawn shut with two short pieces of rope. The harvest bucket, akin to a baby carrier, holds cargo almost as precious. A short time passes, their buckets fill. Neither Richard nor Michael bound down the ladders, instead they move slowly retreating to the ground. 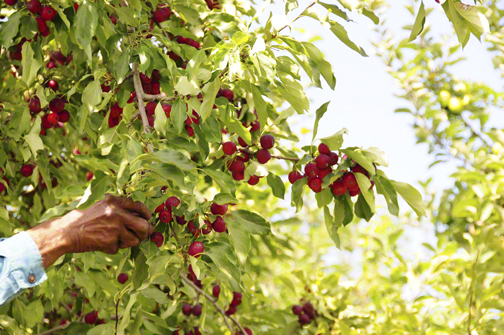 Scott Farm, located in Dummerston, Vermont, is lucky to have dedicated Jamaican orchardists. Michael Johnson (on left) is Scott Farm’s fastest picker. Lionel “Richard” Henry (on right) is a trusted team leader. 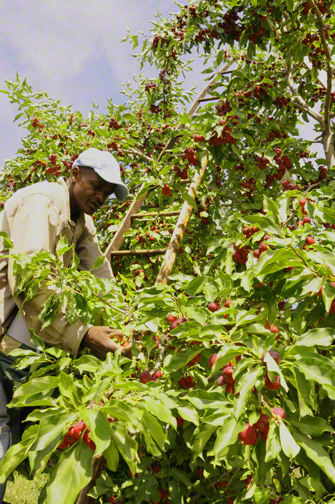 Richard has set the wooden bushel boxes in the shade of the Dolgo crab to protect the just picked fruit from the strong summer sun. Michael is first and hovers over one of the boxes. Releasing the knotted stays from their keep, he slowly lowers the the circular canvas apron and its contents into the box. Controlling the gravitational speed of the departing apples is an important step, if they travel too fast they will bruise not only from hitting the bottom of the box but from bumping neighboring apples. It is an amazing sight to watch grown men so cautious and gentle with the fruit. Picking Dolgo crab apples at Landmark Trust USA’s Scott Farm heirloom apple orchard in Dummerston, Vermont. 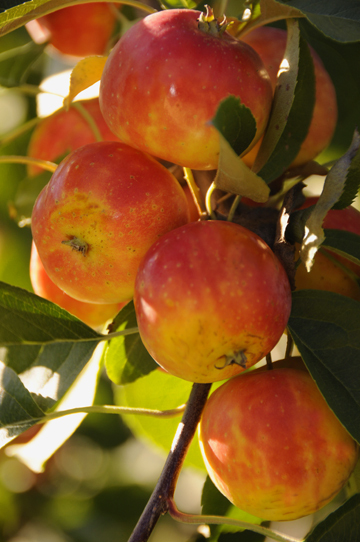 Picking heirloom apples such as the Dolgo crab, is a tedious and exacting art. 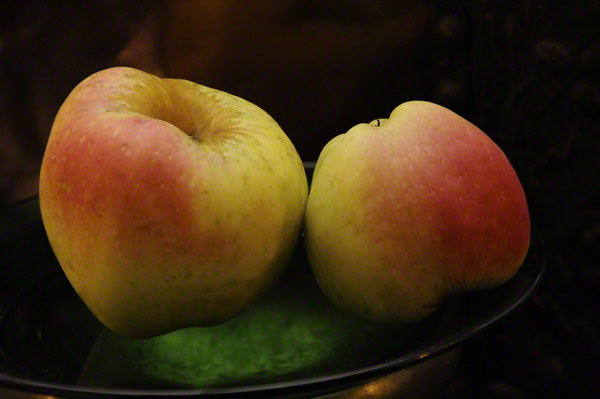 They continue picking, I inspect a neighboring tree filled with small, freckled yellow apples — Ananas Reinette. 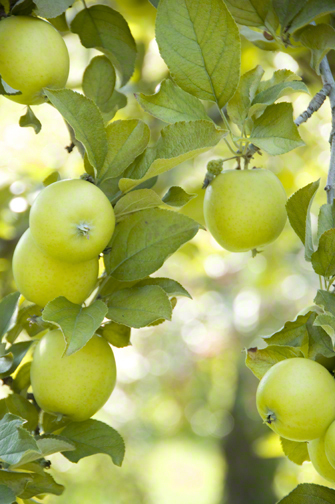 Ananas Reinette, a heirloom apple from the Netherlands, is a small yellow apple with freckles and is one of our favorites. Early in the season they remind me of limes, similar in shape in color. Their expected harvest date is not long off and we are looking forward to tasting them — they have a sharp, juicy-sweet acidity. Ananas means pineapple in French, textbooks note the Ananas originated in the Netherlands in the early 1800s. I like eating this heirloom apple with a couple of gooey slices of a good camembert, it is also good with feta cheese in a salad, is great sliced into yogurt, and recently I’ve been wondering if I could use them as a substitute in a pineapple upside down cake. 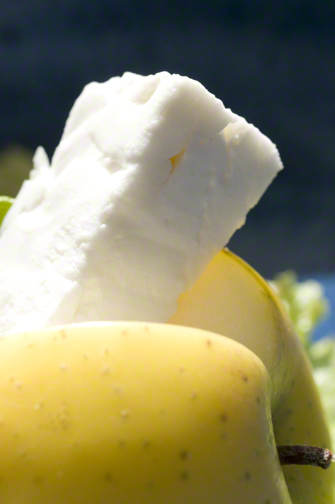 Ananas Reinette is delicious heirloom apple sliced into a salad with chunks of feta cheese. I ask the guys if pineapples grow in Jamaica. “Sure, sure,” they reply in their Jamaican lilt. Richard tells me he grows them on his farm. I’m not sure I’ve been aware all these years that Richard has his hands in the soil at home. He tells me he grows sweet potatoes and corn. His brother and a friend take care of this place when he comes north for Scott Farm‘s seasonal work. I ask him what his soil is like and he says it is different, lots of clay. They work the soil digging up the clay, baking clods of it in the sun, then break it up amending it with animal manures. Both men have come to Vermont to utilize not only their orchard skills but also their attention to detail when packing apples for market. They wake each day at 5:30 spending a bit of quiet time with a cup of tea. By 7 a.m. they have left the farm’s apartment to open and stock the farm stand. Depending on need they may spend the morning trimming out pervasive invasives from under apple trees. When morning dew has burned off the fruit, they will pick the varieties that have reached the proper stage of ripeness. Richard and Michael are nearly finished. I watch their technique, two hands are necessary — one to hold the branch, the other to pluck. Michael pinches the small apples between his fingers and gives a quick flick backwards collecting four, five, six Dolgo crab apples before dropping them gently into his bucket. I never hear a thump, maybe a tiny bumping as he gently drops them in. 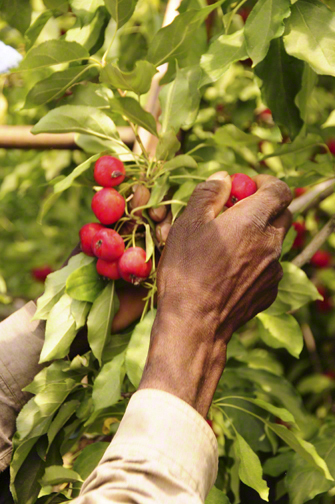 Michael Johnson uses two hands when picking Dolgo crab apples filling one hand with up to six heirloom apples while the other holds the branch steady. 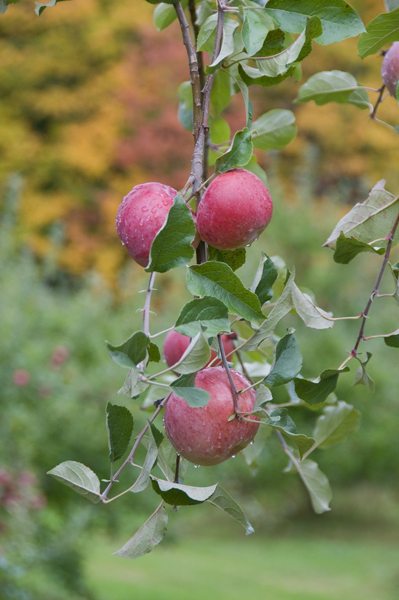 Out of the 90 varieties of apples in the Scott Farm orchard, the Dolgos take the longest to pick. Hewes Virginia Crab would be a close second. 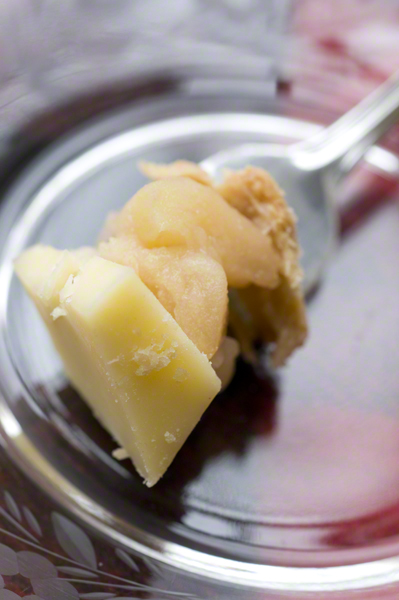 Thomas Jefferson grew Hewes at Monticello and used it to create a dry, highly flavored hard cider. 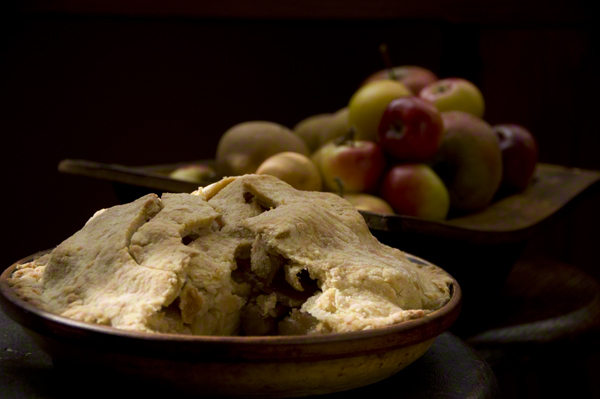 Hewes Virgina Crab, a heirloom apple loved by Thomas Jefferson. 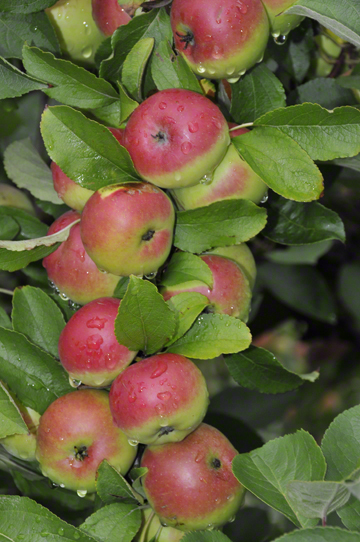 Lady Apple, another mini apple, is one of the oldest varieties dating to early Roman days. It is one of the best keepers at the farm. The coolers where the fruit is stored are shut off the first of December when Scott Farm sells out most of the apples. With luck there will be a half bin left of these cheery red and green apples with a white crisp flesh that becomes pleasantly aromatic in keeping. Lady Apple is also know as the Christmas Apple. With their cheery colors — red, green and a flash of yellow — they are a good choice for holiday decoration tucked in amongst cut boughs of pine and holly. 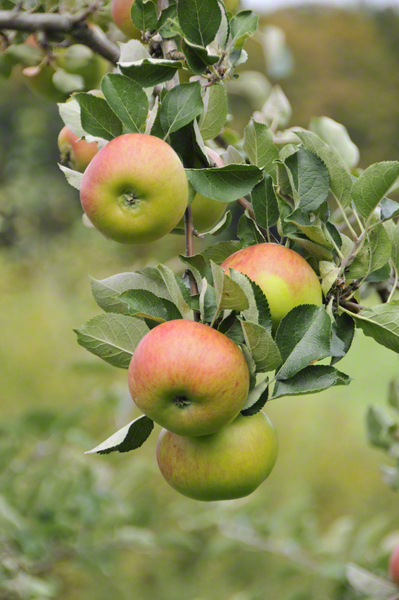 The Lady Apple or Christmas Apple is oldest heirloom apple variety grown in Vermont. Dating to early Roman days it is a great winter keeper. 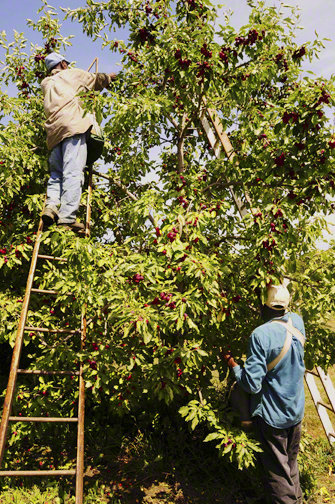 At 3 p.m. they finish, in two hours they have picked 6.5 bushels of small, beautiful ruby red fruit from one tree. Heirloom Dolgo crab apples fill a bushel box. David Tansey is past President and CEO of The Landmark Trust USA and Scott Farm. He loves answering questions and sharing knowledge as he has been involved in every step of revitalizing The Landmark Trust USA and Scott Farm properties. He may be reached at (802) 431-7111. Please ask Jane Booth for permission to reproduce her copyrighted photographs and/or writing. Email jane.booth.1@gmail.com or call (802) 431-7111. Jane has spent a good part of her career photographing and writing about gardens and small farms for Gardens Illustrated, Yankee Magazine, Country Living, Country Living Gardens, Better Homes & Gardens, New Old House Journal, and Cape Cod & Islands Home where she produced an ongoing column and feature stories. This entry was posted in An Apple a Day, cooking with heirloom apples, cooking with orchard fruit, Picking Dolgos and tagged Ananas Reinette, antique apple photographs, antique apple pictures, antique apples, apple orchard, apple trees, apples, Christmas Apple, David Tansey, Dolgo, Dolgo crab, Dolgo crab apple, heirloom apple orchard, heirloom apple photographs, heirloom apple pictures, heirloom apple trees, Heirloom apples, heritage apple trees, heritage apples, Hewes Virginia Crab, Jane Booth, Lady, Lady Apple, nature, plants, uncommon apples, Vermont, Vermont apple orchard, Vermont food, Vermont Fresh Network on August 8, 2012 by Jane Booth.